Navitron Renewable Energy and Sustainability Forum > SOLAR PHOTOVOLTAIC > Solar Photovoltaic Systems > Samil inverters rock! But lucky the manufacturers assume it's fairly likely to happen and build in appropriate protective measures to prevent inverter damage. we've now installed a few of these inverters and are quite liking them fwiw as a basic but still relatively efficient and well built unit. By 'relatively efficient' - don't you mean one of the most efficient? There aren't many that exceed the Samil efficiencies. Hi, these are great inverters, they have been very reliable and give good yield. The name is a bit new and i can understand any concerns people would have seeing this new name crop up. Google about, there is a great article on them via an Austrailain site. The folk down under love them. Also, from an installer point of view they are light easily setup. I believe they also ship with a 10 year insurance backed warranty (dont quote me, relying on my memory here!). Strange post this, but was meandering my way through some inverter tech sheets whilst bored (as you do!) and was struck by both the efficiency ratings and prices of these inverters. Also, they seem to have a nice range. Whilst my research hasn't been huge, the 3,680W limited 4kW dual MPPT model is the first one I've found that could cope (I think?) with my two roofs at different pitches, with 13*185W panels and 5*235W panels. I don't think I've seen any other model whose voltage range (and MPPT range) covers both extremes. Nice! Will keep that in mind as and when one of the two inverters (SB1200 & SB2500HF) dies. The improvement in efficiencies would probably add 100kWh's pa to my ESE system. Just wondering if anyone has any new thoughts on these inverters. Will they drive down the prices of European inverters? Are the initial impressions on quality holding out? Does anyone know the prices of the extended warranties? As I said, strange post, and strange ponderings, but an interesting range to keep an eye on. SMA 3600TL-21 would probably do that situation as well. re Ivan's earlier post, by relatively efficient, I meant relatively efficient. According to the spec sheet they should be slightly more efficient than the SMA and Aurora TL inverters, but less efficient than the steca SG3600, which is what we're mostly installing at the moment, hence my 'relatively efficient'. I've still had no issues with any of these inverters we've installed, so looking good. They will feed in higher levels of DC current to the grid than the SMA, Aurora etc. and aren't covered by manufacturers statement about them being designed not to, so they should not be used with standard RCDs. I've not seen a supplier point this out as yet, and you really have to know what you're looking for to pick this info out of the installation manual. Thanks Gavin, just looking at the SB3600TL and (of course) you're right, looks like the voltage range would do it. Nice, that's another option, though I suspect my options will grow considerably over the next 5 years or so, maybe even find a 3 MPPT inverter so I can add 1kWp of ground mount SW panels too, to the ESE mix, but doubt I'll ever get that one past Wifey! It looks to me that you want to aim for/expect 95%+ then the gains start to drop off, but worth chasing. Is it sad that I find this stuff interesting? Gavin, do you think these 'cheap' Chinese jobbies will drive down prices? Although I note that the Steca is actually much closer to the price of the Samil than the Sunny Boy anyway. 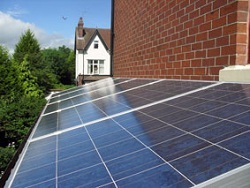 Brave new world, assuming the PV industry in the UK can survive long enough. My Samil is still going like a train, and hasn't missed a beat since installation - they are very configurable using the provided software, and I'd continue to recommend them as a very viable "alternative" to some of the better known names. They're very widely used and respected "down under"
Afore do a range of inverters with twin tracker at the 3000/ 3600 /3800w marks which is rare and the price is excellent. They have 5 year warranty as standard. Slightly cheaper than Samil . I have used Samil and will now try some Afore's next week as it is a well known supplier if it goes wrong. Afore? never heard of them, so not that well known. Mart.. yes I think they have already driven prices down. Remembered the other point with them is that they don't have a full scan function to mitigate shading like the SMA and Aurora versions do, so we don't use them in shaded conditions, in unshaded conditions though they ought to outperform the SMA & Aurora by percent or 2. Proton magazine gave Samil them a very positive review as well. Says "Use for indoor or outdoor (IP65)"
... but in the picture it looks full of holes! Is it really waterproof, or is that an option? Can anybody confirm they have got the 4000tl-d to work on the ethernet port with a pc or iphone/ipad? Which version of solar powerbrowser is needed. I am readying myself for my install and would appreciate any advice given. After reading this I want connect my Samil 3680TL inverter to a spare RJ45 port on my router rather than USB on the PC. Samil manual says, RS232 (DB9) pin2 RxD, pin3 TxD, and pin 5 Ground, but I am not clear what pins to connect to on the RJ45 Plug. I have seen a few examples on the net but they are not all connected the same way, below is one example. Does anyone know if this would work, if not any suggestions as to what pins on the RJ45 I should use? I have read that if it's wrong it won't damage anything but simply won't work, anyone know if that's right?